The best kind of LinkedIn recommendation comes from employers, VIPs, or customers. These are people with a lot of things on their plates. The fact they took time and wrote you a recommendation speaks volumes and proves that you truly did something important. Recommendations by colleagues and people in lateral or lower positions are useful, but not nearly as powerful. The quid pro quo recommendation, given out of duty, impresses no one. Check out the following figure to see the types of people you should ask for a recommendation. 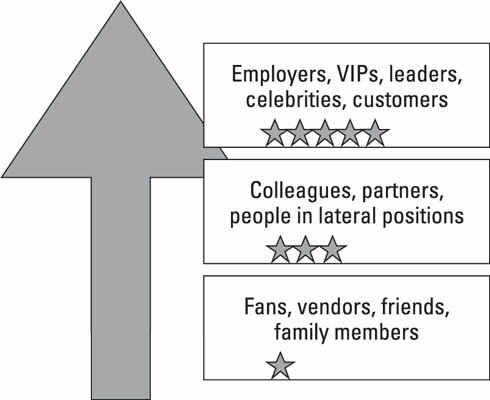 Order of recommenders by importance. Who have you provided value? Who has recently thanked you? Who has a large LinkedIn network? Who is active on LinkedIn? Who shares your target audience? When a person writes a recommendation for you, that recommendation is also listed on that person’s profile. By making sure the person has a large network and shares your target audience means more eyes on the recommendation, which might translate to additional opportunity for you. You can only request recommendations from people who are on LinkedIn and connected to you. However, if you want to add a recommendation from a person who is not on LinkedIn or from someone who has passed on to the great beyond, you can scan the recommendation and add it to the experience as a multimedia file. If you were unable to come up with a list, what are you waiting for? Go out and start impressing people, help others, and start participating in random acts of kindness.